In September, we teamed up with Honest Mum to ask parents about their autumn half-term travel plans. Interestingly, only 14% of the 10,000 plus respondents were planning a trip abroad, with the overwhelming majority (86%) planning a staycation or simply choosing to stay at home. 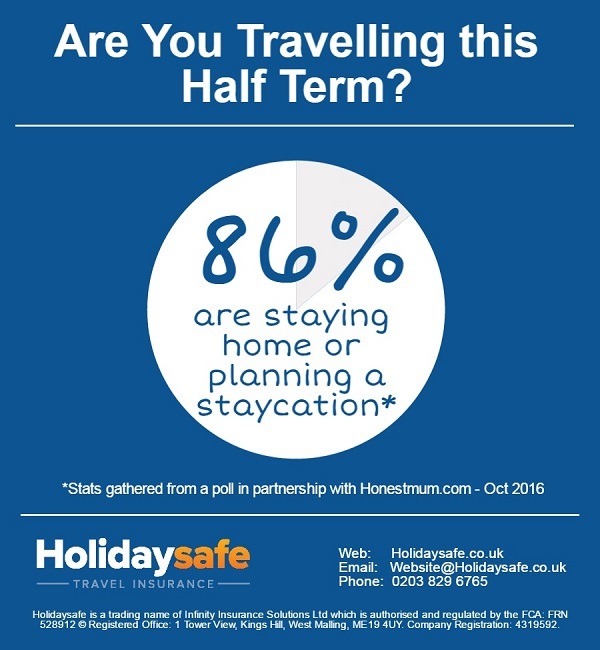 These results are backed up by a recent survey we completed, which found that 75% of Holidaysafe customers were not planning a trip abroad this October. However, the reason for this dip in half term holidays is still unknown, as 90% stated that the fluctuations in the US Dollar and GBP currency rates have not changed their travel plans, and 80% said that migration and terrorism issues had not made them more interested in taking a staycation. However, a study by Direct Line has found that around a fifth of adults do not use their annual holiday entitlement. The explanations for this varied, but top reasons included being too busy at work to take time off, and being limited as to when they could actually take holidays, e.g. due to school terms. To avoid unhealthy levels of stress, it is really important that we each take our full holiday entitlement (- it’s there for a reason! ), either to reconnect with family or simply to escape the rat race. Whether you’re day dreaming about a relaxing visit to Cornwall or a sun drenched beach in Florida, Holidaysafe can provide award winning travel insurance to suit any family holiday or budget. Visit Holidaysafe.co.uk for more information and a free quotation (don’t forget, kids go free on our family policy!). To incentivise people to answer our poll with Honest Mum, we entered each respondent into a prize draw to win a £50 Selfridges voucher. I am very happy to announce that the winner of the voucher was Clare form Shipston on Stour. On behalf of the entire Holidaysafe team, I would just like to thank everyone who took the time to answer the poll, and we hope Clare enjoys spending her voucher!